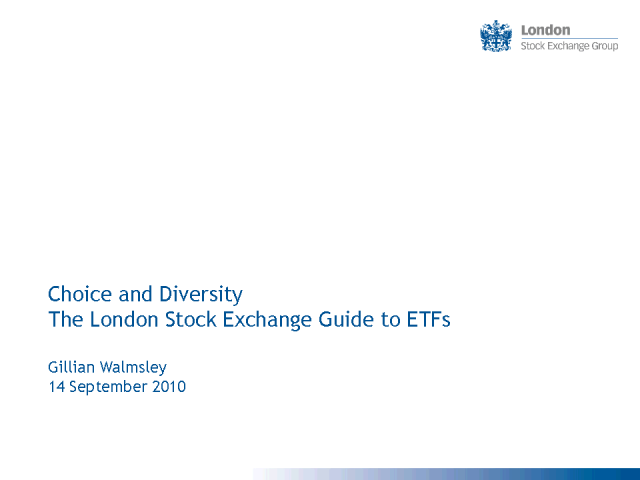 This presentation will provide a guide for IFAs to utilising ETFs on the London Stock Exchange. It will highlight the continuing development of these simple and flexible investment tools and identify the key drivers for the market's continuing growth and expansion. We will explore key trends in new product development and discuss what the future holds for this market. Gillian Walmsley is Head of Fixed Income Products at the London Stock Exchange and covers the Group's London markets for ETFs, ETCs and ETNs in addition to Fixed Income & Securitised Derivatives.